Summon: +1/+1 if you have another creature with Guard. Snowhawk Detachment is a common Willpower creature card. It is part of the Heroes of Skyrim expansion. This card's summon ability applies the Squad Goals card effect. 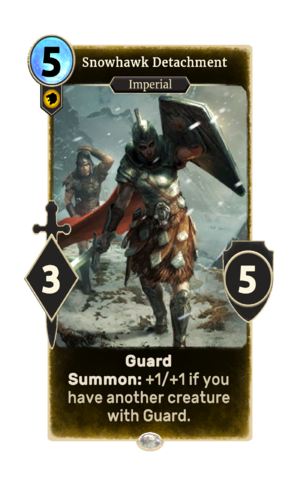 This card is named after Fort Snowhawk in Skyrim.